This article covers the detailed information about technical interview specially for computer science interview questions. Technical interview questions asked from different computer science subjects and programming language are listed in this article. Some common subjects to be ask in a technical interview . How to prepare for technical interview ? This article covers the detailed information about computer science interview questions and their answer. Technical interview questions and answer asked from different computer science subjects and programming language are listed in this article. What is technical Interview ? Technical interview is an important part of recruitment process. During the technical interview interviewer checks your knowledge in your field of specialization. 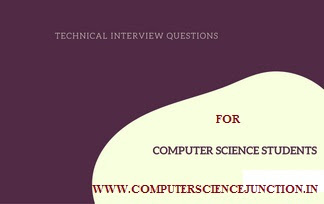 For example during computer science interview questions from different computer science subjects and programming languages . Technical interview assess your ability and technical knowledge related to required job profile. Interviewers check that whether you are suitable for that job to work. During my literature review to write this article I have found 5 Ways to succeed at a Technical Interview. Interviewer asks some technical questions related to job profile. He/she see your resume and ask some questions from your technical skills. Some time technical interview also will be conducted over Skype or telephone. So you should have sound knowledge in your technical skills. This article basically focus on computer science interview questions and answers. What is interviewer looking for in technical interview ? As I told your previously first thing that interviewer want to know about you during technical interview is the extent of your technical knowledge and the knowledge required to work for job profile. Most important thing that interviewer judge is your practical skills. If your theoretical concepts are good but on practical aspect if you are weak then this is not good for you. They test how much able you are to apply your knowledge on real world situation. During technical interview they may give a problem and ask you to solve that problem and explain your solution. By doing this they want to test your explanation skills, reasoning and analytical ability. How you reach that solution ? how you answer the questions this is more important for them. For example if you are a computer science student then your coding skills should be good. Learn Coding Skills Here. What are common subjects to be ask in a computer science technical interview ? Before going to technical interview you should keep in mind the following tips for computer science technical interview preparation. First thing that should remember is that interview isn’t just about assessing your technical know-how, but they also assess that how well you interact with people. Body language is another important factor that affect your interview result. So You might want to take a look at some of our interview techniques and interview body language tips for some pointers, specially for face to face interview. What to wear for a tech job interview ? Don’t be nervous take a breath and see if you can reach an answer using your existing knowledge, logic and creative thinking. The interviewer might be more interested in how you tackle a difficult question or problem, rather than whether you reach the right answer. Always try to answer a question, no matter how hard it seems. If you really can’t answer a question, then tell them so. It’s far better to admit it than covering up the fact that you simply don’t know the answer. I hope these tips computer science technical interview preparation will helps you a lot.